Scribd, a site that built a community around sharing documents online, launched an improved Flash viewer for documents. iPaper allows you to view PDF files, Word documents, PowerPoint presentations, Excel spreadsheets in a lightweight widget, but also do other things like zooming, searching inside a document, sharing or printing. "The primary design goals of iPaper were that it be fast, light and easy to use. At 100 KB the iPaper application is about 1/1000th the size of Adobe's Acrobat Reader software, making it an incredibly fast way to view documents," explains Scribd. While the viewer lacks some features from Adobe Reader, most notably a way to copy text, it renders documents at a high quality, preserving the layout and the pagination. Similar to YouTube, you need to upload your document, wait until it's converted to Scribd's internal format (that shouldn't take more than a minute) and embed the code into your site. Scribd lets you upload multiple documents at a time and it displays useful stats: the number of views, search queries that led to your document, a visitor map and more. The site also launched a platform "that allows anyone to bring the iPaper experience to their own website." You could add some code that replaces the links to PDF or Office documents with links to Scribd's viewer, without having to convert the documents manually. All in all, Scribd has one of the best online PDF viewers and could complement Google Docs, which lacks very good document viewers, shared spaces and a community. I work with Scribd's PR firm. Just wanted to let you know that iPaper does support copy/paste, although I see it doesn't seem to be working in the doc you embedded. Here is another document taken from the front page of Scribd where you can copy/paste. It works on most, but is still a little buggy once in a while. Just for good measure, one more example from the home page. iPaper indeed supports copy/paste, but the button does not appear when the iPaper window is displayed in a narrow space. Simply click the fullscreen button at the top right to display all the buttons on the toolbar. I noticed the button that lets you select text, but you can't copy it. I tried Ctrl+C, but it didn't work in most of the documents I've tried. Evan's example seems to be mostly OK.
Ctrl-C worked fine for me in firefox. I really like this online document viewer! You can share and display any document (more than 200 document types) in your own blog or on any website where you can add html code. Simply copy paste the embed code from Docuter (www.docuter.com) into your blog or web page and give a unique viewing experience to your users. Docuter (www.docuter.com)gets indexed by all major search engines so you can even drive traffic back your blogs and pages. Sharing Documents has never been so easy. 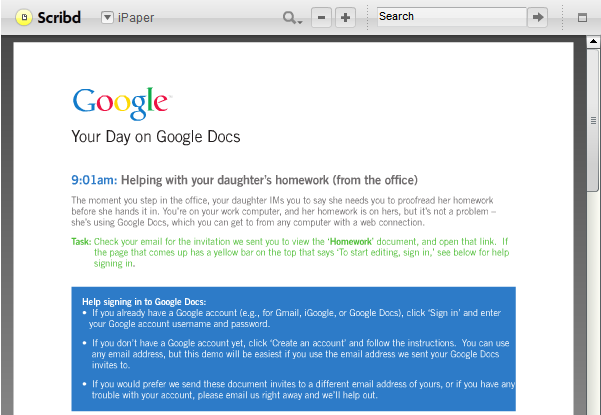 With Docuter now you can upload documents and send a link to the document to anyone. You also send Advanced Link where you can disable the printing on that document for that person. So that user can only view the document and not print it. http://www.devaldi.com/?page_id=260 appears to only convert PDF's though, what if you want JPG's, docs, excel etc. Is there any other Viewer Which can convert all Docs into a plain html without losing the native doc format.